Waking up to the first cool morning in a month. Pulling on sweatpants and socks never felt so good! 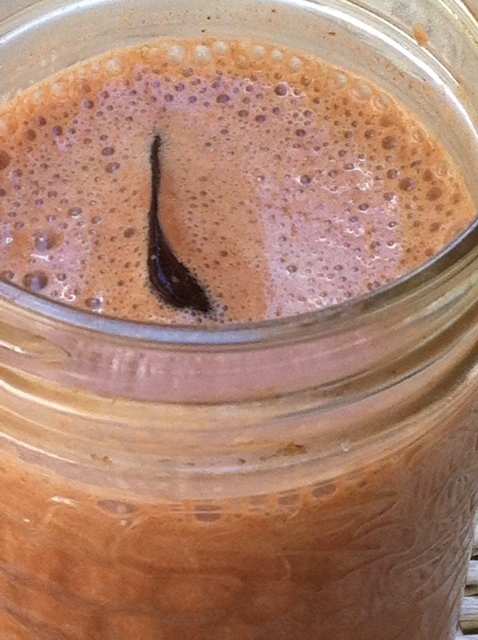 1 c. cold almond milk + 1 tbsp cacao powder + 1 tsp honey blended into a frothy chocolate milk that will save your soul! Being pleasantly surprised by a baking experiment. Especially when that experiment tastes like pancakes and includes fresh Ontario peaches! Mix flour, sugar, salt and baking powder in a bowl. In a separate bowl whisk together almond milk, eggs, vanilla and oil. Add wet ingredients to flour mix and combine until smooth batter forms. Add 3/4 of the peach slices (save some to top the cake). Pour batter into a 8 or 9 inch spring form pan lined with parchment paper. 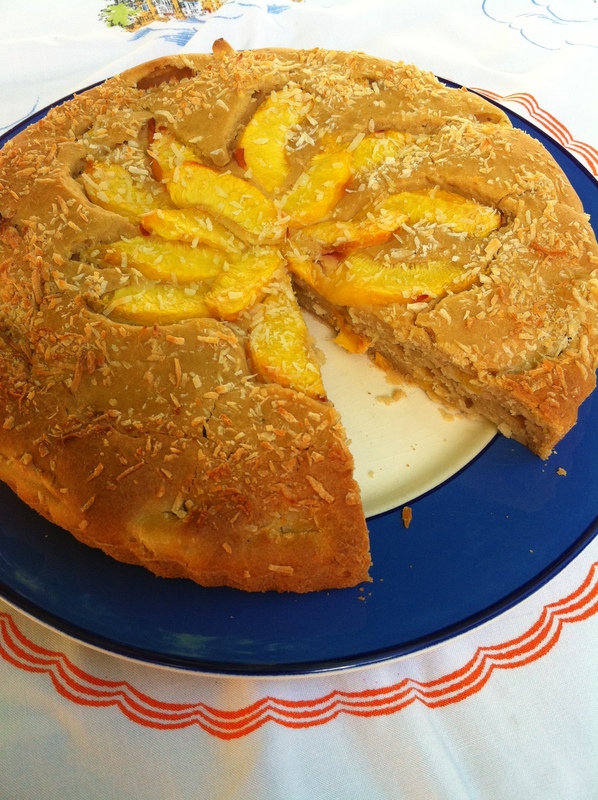 Even out batter and top with remaining peach slices and a sprinkling of shredded coconut. Bake at 375F for 30-40 minutes. The top should be golden brown and a toothpick inserted into the middle should come out clean. Let cool for a few minutes in the pan. Then move to a cooling rack. Once cooled, store in an airtight container in the fridge. Warning: you may have difficulty stopping at just 1 slice! Notes: I found out about Cuisine Soleil from one of the lovely owners of Mylk Uncookies and wanted to give it a whirl. It’s nice to have something on hand that doesn’t involve measuring out a zillion types of flours. I’m sure another blend would work nicely. I think almond flour would compliment the peaches (will try that next time!). I have been experimenting with Xylitol in order to reduce my sugar intake and have found that it works best in combination with another sugar to avoid that overly sweet artificial flavour. Coconut sugar is a great lower GI alternative to regular sugar. I used grapeseed instead of coconut oil for a change but I bet the combo of coconut and peach would be delicious. This entry was posted on August 9, 2012 by katelivingfull in Sweet Recipes and tagged almond milk, blood sugar balancing, chocolate, coconut sugar, dairy free, gluten free, peaches, raw cacao powder, raw honey, vegetarian, xylitol.